In 4.09 & in latest beta version, but detected by other programs. i use it in conjunction with rivatuner server to show in-game. can i edit it the *ini file to make it detect it? 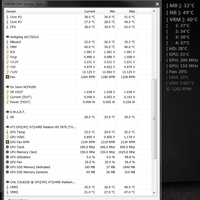 Win7 64Bit, i7 920 DX58SO board, latest chipset drivers & bios. I need to see what HWiNFO reports exactly, so could you please attach a screenshot of the sensors window with all values, or HWiNFO Report File with sensor data and the HWiNFO Debug File. (03-05-2013, 08:22 PM)Martin Wrote: I need to see what HWiNFO reports exactly, so could you please attach a screenshot of the sensors window with all values, or HWiNFO Report File with sensor data and the HWiNFO Debug File. Hello Martin, thank you for taking the time to assist me. The "MBoard" temperature under the Adigilog sensor was originally named by HWiNFO as "IOH", but you seem to have renamed it to MBoard. So that should be the IOH temperature you're searching for. (03-08-2013, 06:55 AM)Martin Wrote: The "MBoard" temperature under the Adigilog sensor was originally named by HWiNFO as "IOH", but you seem to have renamed it to MBoard. So that should be the IOH temperature you're searching for. 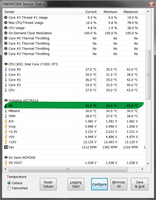 so the real problem is ICH is reading the Motherboard 's temp' sensor. Could you please attach the HWiNFO Debug File, so I can check it in detail? Thanks. I think I found the problem. A fix will be available in the next build released. it detected it as motherboard, but that's fine, i renamed it, now all good.